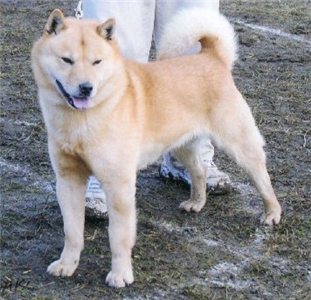 The Hokkaido (北海道犬, Hokkaidō-inu or Hokkaidō-ken) is a breed of dog. Other names for the breed include Ainu-ken, Seta, Ainu dog. In Japan, its name is sometimes shortened to Dō-ken. The Hokkaido is native to the prefecture of the same name in Japan. Appearance The breed is medium in size, and has small, triangular, upright ears. The small eyes have a rising triangular outline. The Hokkaido has a coat of long, stiff fur, and a second, shorter coat of soft fur. Colors include red, white, black, tiger, sesame, black and tan and wolf-gray. Males are typically 50 cm tall, and females a few centimeters shorter, with body masses in the 20 kg range. Temperament The breed is known for fidelity to its owner, bravery, and the ability to withstand the cold, among other traits. It has an innate sense of direction and can therefore return to its master no matter how great the distance. This breed has the unusual capability of fighting against the Hokkaido Brown Bear, or Higuma to protect its master. The way in which the Ainu Dog accomplishes this is to attack the bear's back, then bite and hold the dorsal flesh of the bear's neck until the bear retreats. Despite its long history as a working breed, the Ainu Dog ideally combines the roles of family pet and hunter. This breed should not be allowed to run free around other animals. They are good with children if they are raised with them as pups. This dog is not recommended for apartment life. It is moderately active indoors and will do best with a large yard. The Hokkaido is thought to have its roots in the Matagi-ken （Japanese:マタギ犬）（hunting dog, Bear hunting dog, Deer hunting dog） a breed brought by the Ainu people from the Tohoku region in the Jōmon period. The later Yayoi people brought a different breed to the Tohoku, but the isolation of Hokkaido led to its line of Jōmon dog having the least influence from the Yayoi. In 1869, the English zoologist Thomas W. Blankiston gave the breed the name Hokkaido. The breed was useful in the search for survivors of an Army expedition that was caught in heavy snow crossing the Hakkōda Mountains of Aomori Prefecture in 1902. In 1937, the Ainu dog was designated in Japan as "a rare species protected by law" by the Ministry of Education and it was decided that the official name of the breed would be Hokkaido-Inu. However, the dogs are almost always called Hokkaido-Ken among the Japanese people. In 2007, Japanese telecom company SoftBank began using a white Hokkaido named Kai-kun (カイくん) in its commercial campaigns for their White Plan where he stars as "Father" (お父さん, Otōsan) or Jiro Shirato (白戸 次郎, Shirato Jirō), the patriarch of the Shirato family, with his wife portrayed by Kanako Higuchi, children portrayed by Aya Ueto and Dante Carver, and mother portrayed by Ayako Wakao; Father's speaking voice is provided by Kin'ya Kitaōji. The commercial series won the 2008 ACC Grand Prix Minister of Internal Affairs and Communications Award. The American director, producer, screenwriter, and noted Japanophile, Quentin Tarantino, guest-starred in an installment of this series of commercials. Health The Hokkaido dog has a very high rate of Collie eye anomaly (CEA). About 1/3 of Hokkaidos are affected by CEA while 2/3 are carriers.